The 1974-75 season was not a particularly exceptional or standout season in many ways. It was just a normal, average run-of-the-mill season in most respects (an interesting title race excepting, possibly). So why commemorate it here, you may well ask. Well, simply put, you never forget your first, and 1974-75 was my first: my first real season following football, that is. Let’s rewind slightly to the May of 1974 and the very first stirrings and interest in this crazy game of football we all know and love. Five-years-old on FA Cup Final day and I’ve plonked myself rather reluctantly in front of the television with my Manchester United-supporting father. We’re living in a perfectly respectable semi-detached house in the village of Wrea Green, halfway between Blackpool and Preston, and the old chap, being of a certain vintage, is naturally supporting the team closest geographically. This means he is favouring Kevin Keegan and his Liverpool boys over Malcolm ‘Supermac’ MacDonald and his Newcastle cohorts. At the seemly ripe old age of 5 I can’t really give much of a proverbial one either way, but seeing my dad working himself up into a lather is mildly interesting I guess and so I reluctantly put down my Wombles 1975 annual and take heed of the proceedings unfolding in front of me. Ninety minutes later and the old fella is in a state of nervous exhaustion, Liverpool are jogging round Wembley with the cup, and I’m hooked for life – on both football in general and Liverpool in particular. From that moment on, both entities become an obsession and take on a life of their own and things can never be the same. 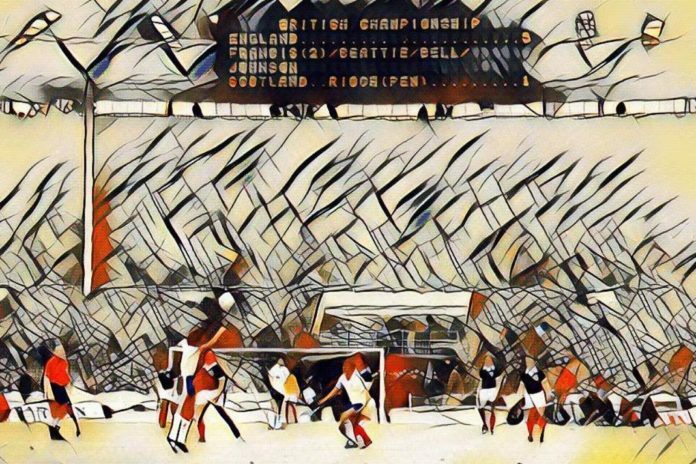 The 1974 World Cup rolls around, and although I’m not really sure of the mechanics and of what’s happening, I don’t exactly complain as the matches come and go. Soon enough Pater and I are repeating our cup final bonding experience as West Germany take on Holland in the final. This time, though, there is to be no happy ending for either my dad or me by proxy, as his favoured Cruyff-inspired Holland miss out to the tune of a 2-1 scoreline. Then, it all gets going again. Before we know what’s happening, the 1974-75 domestic season is upon us and things start moving quickly. Delighted that I am taking an interest in his passion, dad quickly brings me up to speed on the basics and he reliably informs me that Manchester United are the ‘Greatest Team in the World’. My question: “So why are they going to be playing in the second division this season then, dad?” oddly goes unanswered. As a family we would go shopping in Blackpool most weekends, and so the Seasiders, rather than the equidistant North End of Preston, became ‘our local’ team. Unfortunately, due to the scourge of hooliganism in the mid-seventies, visits to Bloomfield Road were few and far between. This meant I had to content myself with spectating the frequent pitched battles in Blackpool town centre of a Saturday lunchtime. A particular highlight came in October when approximately 12,000 Manchester United supporters took advantage of the seasonal illuminations and dropped in for a homely visit to the place of my birth and promptly ran the town and its citizens and authorities ragged. Other high profile incidents occurred when Aston Villa, Southampton, Millwall (inevitably) and local rivals Bolton and Oldham came calling. The most tragic case being the murder of a Blackpool supporter on the old kop at the game against Bolton in August 1974. In the main, however, I satisfied my craving for knowledge about this wonderful new (to me) entity through television. Saturday afternoons in front of Grandstand became the norm, and within a short time I had become a bit of a precious six-year-old know-it-all. I soon worked out who were the best teams and players, and my knowledge for a kid of that age became both a source of pride (in my dad) and of worry (in my mum, who deduced quite correctly that I was becoming obsessed). The season progresses and I get wrapped up in Liverpool. I learn they are a good team, and their cup victory of the previous season is not looking like an isolated success as the New Year comes around. However, Everton lead the way and this budding koppite is sure the title is heading over to Goodison Park and so I put all my eggs in the basket named “FA Cup” once more. Then, disaster strikes: 25 January, 1975, and football breaks this boy’s heart for the first of a million times as Liverpool are dumped out of the cup courtesy of a 1-0 defeat at Ipswich. Oh, the tears – the woe – the wailing – the furiously scribbled letter to one Mr. Robert Paisley, Esquire informing him that if matters do not improve imminently, then allegiance will be directly transferred as a matter of urgency to aforementioned city co-inhabitants. This carefully crafted missive, was as I rather resentfully recall now more than four decades later, the cause of considerable and undignified parental mirth at my expense. However, as it resulted in a reply in the form of a team photo signed by the legendary Steve Heighway, I guess I can claim an overall moral victory if nothing else. Whilst on the subject of parental interjection, a quick study of a certain bearded fellow’s appearance at Chez Nesbit on the fair evening of December 24 might at this stage in proceedings be in order. Liverpool supporting six-year-old yours truly, born and bred in Blackpool, to a mixed parentage of a Manchester United following dad and an avid West Ham supporting mum, reasonably decides to request the rotund chap commonly known as Santa splosh the dosh on a first football kit. Happily the benign old fellow duly obliges, and it comes to pass that at approximately 6:02am the very next morning multi-coloured wrapping paper is duly disposed of at an alarming rate to reveal none other than…….a shining new Chelsea kit! Er, thanks for that one Santa. Anyway, Sunday afternoons become an integral part of the week due to the fact that the regionalised highlights programme gives me my only real chance to actually see any football action. Living in the North-west of England, the highlights package came from Granada and was reasonably good in as much as it featured a wide variety of teams. Often as not the main match would be whichever one of the Manchester or Merseyside clubs was at home that week, but the lesser lights such as Preston, Bolton, Blackpool, Oldham and even Stockport and Southport all had their moments too. An early memory here is of watching the Sunday highlights of Liverpool’s 1-0 away defeat at Sheffield United. I recall getting annoyed that Liverpool seemed to be spending an inordinate amount of the second-half passing the ball gently to the goalkeeper rather than attempting to blast it past him as they had done so in the first half. It was only much later that the concept of changing ends at half time was explained to me! Into March and to FA Cup quarter-final day and once again a memory indelibly etched into my soul. March 8, 1975 saw not only the final eight battle it out on the road to Wembley, but also my father’s 35th birthday, and to this day I can remember the line ups of: Arsenal v West Ham, Birmingham V Middlesbrough, Carlisle V Fulham, and Ipswich V Leeds. The season came to a close with the cup finals of England and Europe, and so I experienced my first real ‘Cup Final Experience’ with the coming together of West Ham and Fulham. I watched every single minute of the six-hour build-up on BBC, and unlike the previous year, really understood what it was all about. By now, of course, I knew all about the history of Bobby Moore and the ‘Boys of ‘66’ and so was aware that he was playing against his old club. I remember telling my dad that as he was the same age as Mr. Moore it still wasn’t too late for him to forge a career in football. Next up, Leeds played in the 1975 European Cup final and I was allowed to watch the first twenty minutes or thereabouts, and so missed the injustice of their ridiculous defeat along with the equally ridiculous subsequent rioting that followed. The only other live football game I remember watching at the end of that season was England’s 5-1 annihilation of Scotland at Wembley when Gerry Francis (and THAT haircut) scored two of the goals. At this stage it was all still innocent and fun and, Liverpool’s FA Cup disaster notwithstanding, all highly enjoyable. I would watch any game possible on television and absorb anything football-related that my six-year-old reading abilities could cope with. I soon became almost prodigy-like in my knowledge of obscure facts and figures. By the end of the season, for instance, I knew the name of every ground, manger and goalkeeper of every first division and practically all second division clubs and would recite them for hours on end as a party piece. The next season, however, things changed and it saddens me now to relate how so. Even at the ridiculously young age of 7, the 1975-76 season seemed to be more serious and winning became more and more important. The butterflies that remain to this day started making an appearance whenever I listened to a game involving my team or waited for the results to come through on the (in)famous Grandstand vidi-printer. In addition, I commenced the life-long habit of laying awake worrying about upcoming fixtures and matches gone past, and looking back now, I can’t help but think enjoyment has been slightly diluted ever since.